GTS025 Graphite Heat Spreader is a thermal managementmaterial with high thermal conductivity and high flexibility. GTS025 Graphite HeatSpreader is high crystallized graphite made from carbon materials in sheetstyle by a special process. It is idealfor providing thermal management solutions in limited spaces. 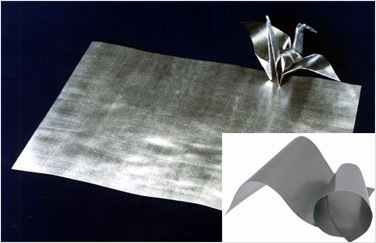 GTS Graphite HeatSpreader is flexible and can be cut into customizable shapes, GTS Graphite HeatSpreader RoHS compliant. 3-----P10 ：PET 10um , PET Standard Thicknesses Available 10um, 30um，50um. 5-----A10 ：Adhesive 10um ，Standard Thicknesses Available：5um，10um，30um. GTS-025-P10GA10 total thickness ：PET tape 10um+GTS 25um+Adhesive 10um is 45um.